Soon to be a movie titled The Exception starring Christopher Plummer, Lily James, and Jai Courtney, this “crisp, adroit, and subtle tale of great personal power” (The New York Times) follows the exiled Kaiser Wilhelm, the young Nazi officer assigned to guard him, and the Jewish maid who unwittingly comes between them. It is 1940 and the exiled monarch Kaiser Wilhelm is living in his Dutch chateau, Huis Doorn. The old German king spends his days chopping logs and musing on what might have been. 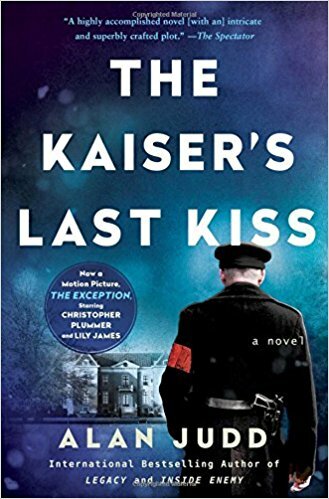 When the Nazis invade Holland, the Kaiser’s staff is replaced by SS guards, led by young and recently commissioned SS officer Martin Krebbs, and an unlikely relationship develops between the king and his keeper. While they agree on the rightfulness of German expansion and on holding the nation’s Jewish population accountable for all ills, they disagree on the solutions. It is always fascinating to get fresh new perspectives on many of the people whose lives were affected by the politics and machinations of World War II. This novel is full of fascinating and mysterious characters who evolve throughout the story, many truly villainous and painfully evil, and others who truly touched me. Although the love story is not a dominant factor, it adds to the ambiance of the tale. One of my favorite plot basics was the setting - an old house filled with precious artifact and antiques. I'm definitely looking forward to the movie version of this story. A quick, easy read which I highly recommend.